David Fricke also wrote about “Solar Secrets” the new album of the band produced by Tony Visconti (David Bowie, T-Rex) Here is garage-glam heaven on a platter: Tony Visconti, who produced hot glitter for David Bowie and T. Rex 40-plus years ago, doing it again with the fine trio Capsula, from Bilbao, Spain. Visconti sets Capsula’s dynamic compression of The Who, the Cramps and Sonic Youth in a high tide of psychedelia (long echo, watery tremolo, massed spires of treble guitar) that makes “Riverside of Love” and “Trails of Senselessness” sound like a fresh afterburn of the ’67 Pretty Things and an acid-charged X. “You gotta be free,” guitarist Martin Guevara and bassist Coni Duchess, Capsula’s founding couple, sing in “Blind.” They’re already fying. (Rolling Stone September 2013). Both musical press and audience agree when it comes to review their great music with several “Best Album of the Year” (KEXP Seattle, Mondosonoro, Ruta 66, Rockzone, Radio 3). 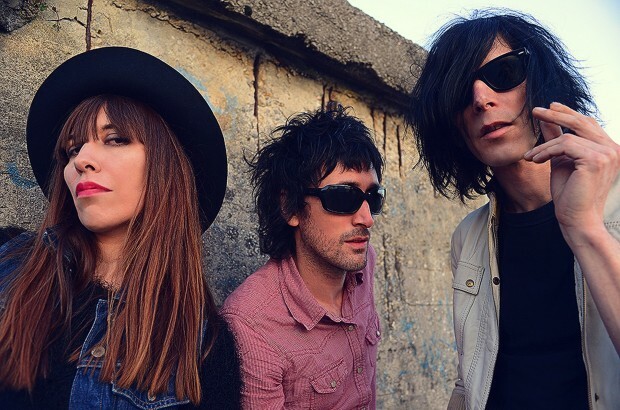 Capsula has a strong and still growing fanbase all around the world, as a result of their amazing live shows and also following them in their active social networks. Their new and already acclaimed new live album “Dead or Alive” has an upcoming North American and European tour for 2015.